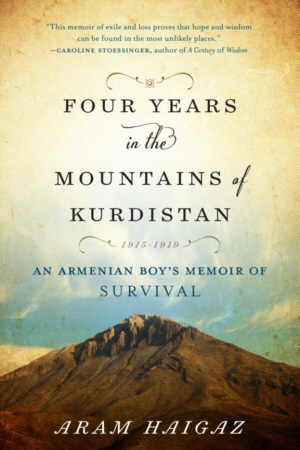 FOUR YEARS IN THE MOUNTAINS OF KURDISTAN is a remarkable first-hand account by Aram Haigaz, an Armenian author and youthful survivor of the Armenian genocide of 1915. This memoir has been made available in English in time for national publicity surrounding the 100th Anniversary of the Armenian Genocide. Armenian Aram Haigaz was only 15 when he lost his father, brothers, many relatives and neighbors, all killed or dead of starvation when enemy soldiers surrounded their village. He and his mother were put into a forced march and deportation of Armenians into the Turkish desert, part of the systematic destruction of the largely Christian Armenian population in 1915 by the Ottoman Empire. His mother urged Aram to convert to Islam in order to survive, and on the fourth day of the march, a Turk agreed to take this young convert into his household. Aram spent four long years living as a slave, servant and shepherd among Kurdish tribes, slowly gaining his captors’ trust. He grew from a boy to a man in these years and his narrative offers readers a remarkable coming of age story as well as a valuable eyewitness to history. Haigaz was able to escape to the United States in 1921. Aram Haigaz was the pen name of Aram Chekenian, an Armenian-American writer who was born in the town of Shabin Karahisar, Turkey. He was a young boy when his birthplace was attacked, and his first book, The Fall of the Aerie, published in an English translation in 1935, is often cited by scholars and historians for its eyewitness details. Although he lived in America for much of his life, Mr. Chekenian, the author of ten books in total as well as numerous articles and essays, chose to write in Armenian. Translated from the Armenian language to the English by his daughter, Iris Haigaz Chekenian, FOUR YEARS IN THE MOUNTAINS OF KURDISTAN is the tale of one young man’s struggle to survive, while also a rich and compelling narrative of life within a little known ancient society and tribal culture. Iris Haigaz Chekenian – Ms. Chekenian is an editor and writer who began her career first in magazine publishing in New York City after earning a B.A in English from Adelphi University, and an M.A. in English from Duke University. She then left New York to work in Hollywood as a story editor on movie and television scripts but later returned for a career in corporate public relations. She currently lives in Manhattan where she is an editorial consultant.